In this Jan. 21, 2016, file photo, school children arrive at Los Angeles Zoo, in Los Angeles. If a teachers' strike occurs Monday as anticipated, affected students will be offered free admission to the Los Angeles Zoo, the Los Angeles County Natural History Museum and the Petersen Automotive Museum. 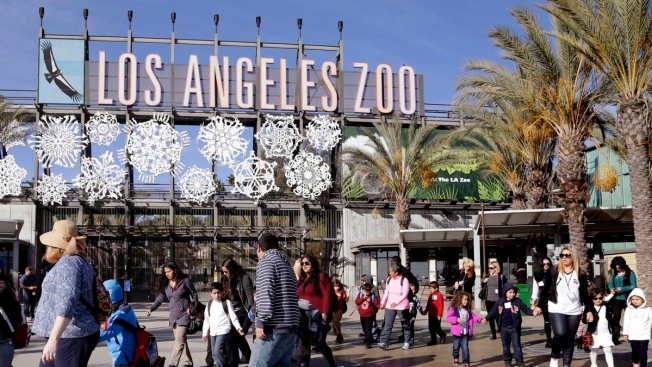 At the zoo, Los Angeles Unified School District students will be given free admission if teachers strike. Students will have to show a school ID, report card, school newsletter or other proof of enrollment to take advantage of the offer, which will available on weekdays as long as the schools are affected by a strike. Students' chaperones will be offered admission to the zoo for $5. Free admission will also be offered to students at the Natural History Museum in Exposition Park, and at the La Brea Tar Pits and Museum in the mid-Wilshire area. The free admission offer, which also includes students' chaperones, will be in effect for as long as a teachers' strike is occurring. The Natural History Museum's offer of free admission is also available to federal government employees on furlough due to the continuing government shutdown. Similarly, the Petersen Automotive Museum is inviting LAUSD students to receive complimentary admission Monday through Friday, from January 14th through February 2nd. Although February 2nd is a Saturday, the museum is extending the promotion to play a part in the Museums Free-for-All Day event. Any visits made during that window, while full of opportunities to eye awesome and sleek autos, also have an educational focus. LAUSD students will enjoy "... the chance to learn about the history and future of transportation during a month packed with special programs including STEAM-based (Science-Technology-Engineering-Arts-Math) tours and design projects, book readings, hands-on crafts, and more." The museum is open through 6 p.m. on weekdays, giving you into the afternoon and early-ish evening to enjoy the cars, programs, and more.